As mentioned last week, we have expanded our selection of gifts for babies and young children. One special line you will find are handmade bibs, throws and dolls that make extra special gifts. First to present are handmade throws. These are 100% cotton with natural fiber lining. These quilts are a perfect size for a crib, receiving blanket, or child's favorite blanket. They measure 45 x 36" and are designed with multiple squares. Backside is flannel. 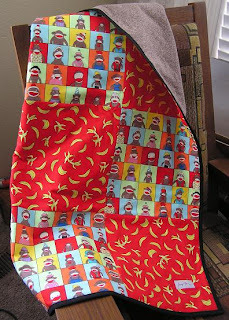 Next, fun and colorful bibs in a variety of prints. Beauty and style with practicality. All bibs are 100% vinyl-coated cotton (higher quality than standard oilcloth). These are machine washable high quality vintage style bibs with catch pouch and snap closure. Print may vary due to cut out of fabric. A must have! Ages 6-36 months. Finally, who doesn't remember those fun monkey dolls Grandma pieced together from socks? Well we have them just for that special little someone. 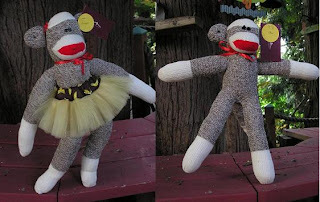 Sock monkeys are made from original Red Heel socks. They are 100% cotton with poly batting fill. They are machine/dryer friendly. These will bring back times of old and young and old alike will love their special friend for years to come. Your choice, boy or girl, named and the girls are wearing tutus!! Don't forget, we pack and ship gifts worldwide. Give us a call to order for that special "enfant" in your life!